Stanfield's Erica Gehrke is surrounded by Brynna Rust and JoAnna Payton as the three react to a freethrow..
PENDLETON - The Heppner Lady Mustangs defeated the Stanfield Lady Tigers at the Blue Mountain Conference tournament at Pendleton on Friday, February 20, 2009. Heppner dominated scoring in the first half and led in the opening moments of the third period when they led 22 to 5. 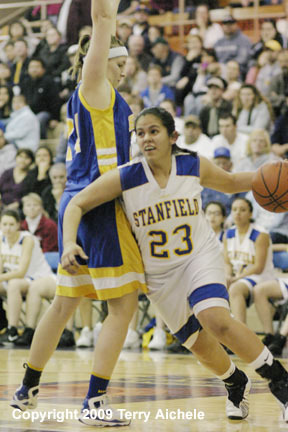 The Mustangs would stretch that to a 26 point lead of 31 to 5 before Stanfield's Jessinia Carrillo finally broke the drought for the Tigers. The Tigers ended up scoring seven points in the third showing that they weren't going to simply fold under the Heppner pressure. Heppner even hit a cold streek with about two minutes to go in the third getting stuck at 33. Stanfield started scoring with about three minutes to go in the third. 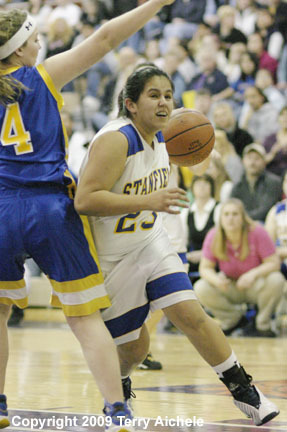 Jessinia Carrillo was responsible for five of the seven points Stanfield scored in the third. The only other Tiger scoring in the third was Mikayla Baros. Scoring for the Mustangs in the third included Bryanna Rust and Catherine McElligott. The Mustangs led at the end of the third 33 to 13. The Mustangs remained stuck at 33 for almost two minutes of the fourth period. Meanwhile the Tigers had scoring by Mikayla Baros, Erica Gehrke, Nathalie Cook, and Jessinia Carrillo. It was a challenging period for Carrillo as she went out of the game with 6:18 to go with what looked like a leg injury. She came back later in the period and was part the run the Tigers had in the second half of the third. The Tigers closed to within nine 44 to 35 with a minute to go. Carrillo hit a trey with 25 seconds to go in the game to make the final score 46 to 38. 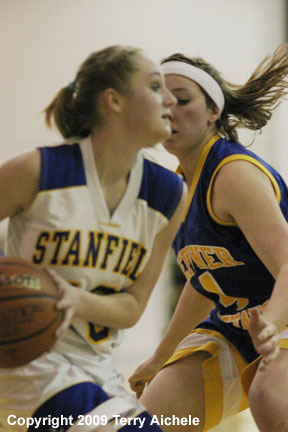 Stanfield had a good fourth outscoring Heppner 25 to 13 but it was too late to turn the game around totally. Hot shooting Mustangs included Brynna Rust, Jessica Hughes, and Erin Price. 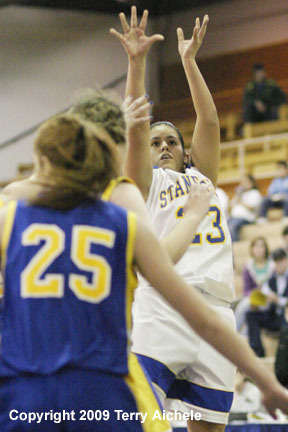 LEFT - Stanfield's Jessinia Carrillo takes a shot over Heppner defenders. 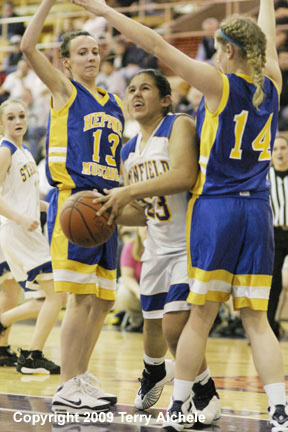 RIGHT - Jessinia Carrillo of the Tigers squeezes her way between Heppner's Catherine McElligott and Erin Price. LEFT - Jessenia Carrillo rolls around a Heppner defender. RIGHT - Erica Gehrke of Stanfield drives towards the basket in the second half of Friday's game..
LEFT - Erica Gehrke of Stanfield tosses the ball to a teammate. 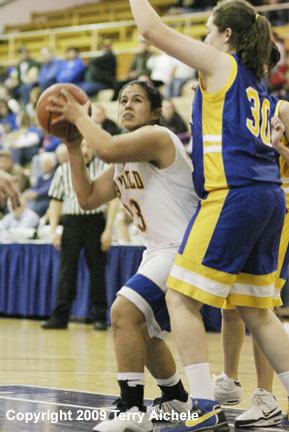 RIGHT - Jessenia Carrillo looks for an opening while being closely guarded by Mercedes Garrett. 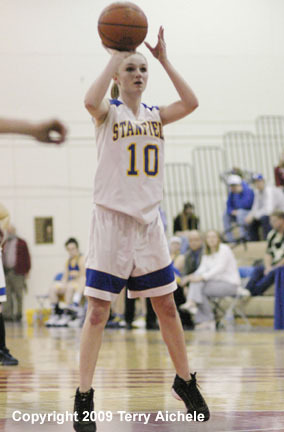 LEFT - Stanfield's Erica Gehrke takes a freethrow during the second half of Friday's game. RIGHT - Jessenia Carrillo of Stanfield grimaces in pain at the 6:18 mark of the fourth period. She wend out of the game but returned several minutes later. LEFT - Jessinia Carrillo returns to action. In this shot she is driving to the basket. Later she would hit a three pointer. 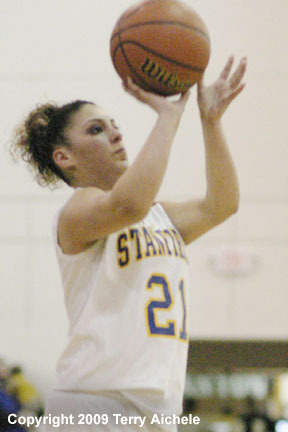 RIGHT - Jade Martinez of Stanfield takes a shot during the second half.